The Coast of India between Calymere and Gordeware Points, including the Coast of Coromandel, with part of the Coast of Golconda. 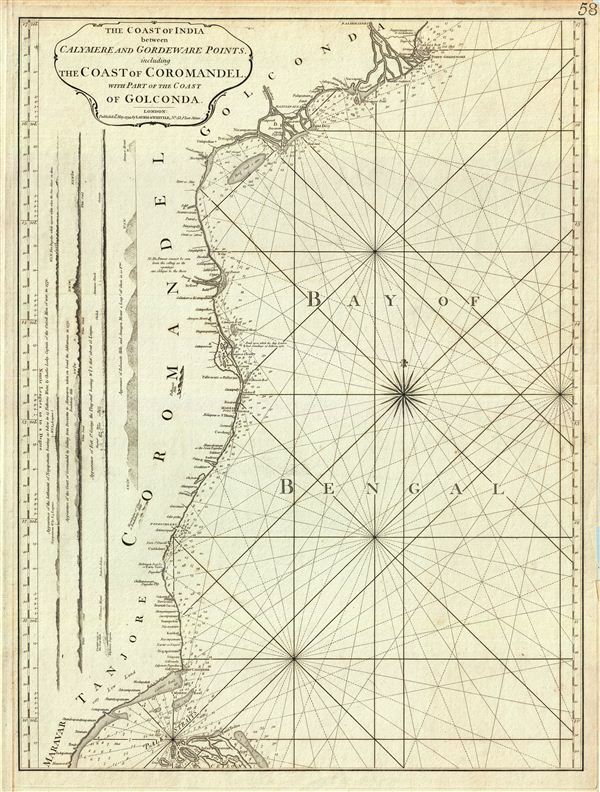 This is a fine example of Laurie and Whittle's 1794 nautical chart or maritime map of the southeastern coast of India or the Coromandel Coast. The map covers the southeastern coast of India from point Gordeware (modern day Godavari Point) and Rajahmundry, the headquarters of the Godavari District during the British rule in India, south as far as Point Calymere (Calimere) in India and Point Pedro in Sri Lanka. Along the left border, the map includes four coastal profile views detailing the appearance of the settlement of Negapatnam, the Coast of Coromandel, Fort St. George and Palleacate Hills. This map notes the village of Coringa on the Golconda Coast, where 20000 people in cyclone just five years before this map was made. The mouths of the Godavari and Krishna Rivers are also noted. The Coromandel Coast begins from False Divi Point (here marked as False Point) and ends at Cape Comorin (modern day Kanyakumari). Point Calimere, known as Ramarpatham (meaning 'Rama's feet' in the local language), is identified in the mythological epic Ramayana as the place from which Rama reconnoitered the demon Ravana's Kingdom in Sri Lanka. The Coromandel Coast was an important region for controlling Indian trade throughout the 17th and 18th centuries. The coast has witnessed countless rivalries and changed hands between the British, Dutch, French, Danish and Portuguese until finally falling to the British in 1847. Pondicherry and Karaikal were retained by the French until 1954. The map offers rich detail including countless depth soundings, notes on the sea floor, commentary on reefs, rhumb lines, sandbars, shoals, buildings, pagodas, place names and a wealth of other practical information for the mariner. This map was published by Laurie and Whittle from their offices at 53 Fleet Street, London, on May 12, 1794. It was issued independently as well as offered in their 1797 East-India Pilot, or Oriental Navigator.